Apparently, good things still happen in 2018? This is Rosey Blair. She's a 29-year-old actor from Texas. Blair most recently starred in an animated series based off the webcomic Cyanide & Happiness. 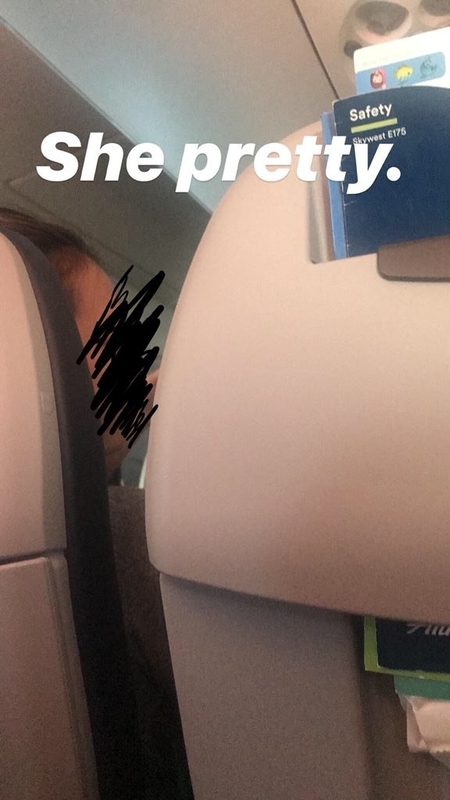 Yesterday, she and her boyfriend were coming home from New York after a comedy festival when, she said, they swapped seats with a young woman, also from Texas. And then THIS happened. Blair told BuzzFeed News that she and her boyfriend were sad they weren't sitting together. "A young pretty woman came and sat by my boyfriend and he asked if she would be alright with the switch," she said. "After we had settled into our seats I made a joke about who her next seat partner would be," Blair continued. "I thought it would be funny if it was a handsome man," she said, "And then — like magic — a handsome man appeared." The man, who Blair said was happy to be identified as Euan Holden, and the unnamed woman immediately hit it off. "My boyfriend and I elbowed each other and were delighted when the pair struck up a lively rapport." He didn't get her a drink when the cart came by, but they apparently did get a cheese board. To share. Blair later said she didn't think anything happened in the bathroom, just that they went to the toilet at the same time. "I thought the story unfolding in front of us was cute, inspirational, and like a real-life romantic comedy," she said, explaining why she shared the story. They started talking about each other's families. And she continued to update her followers online. According to Blair, she and Holden have been texting about the whole thing. 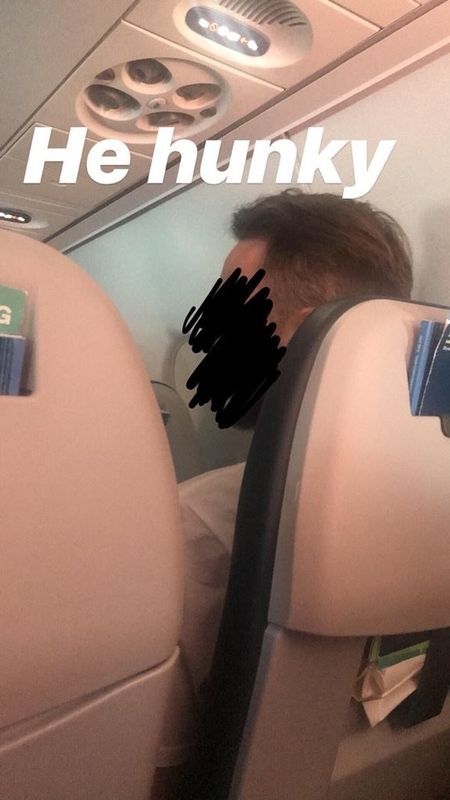 She said he's still trying to get in touch with the woman from the flight. Euan Holden, who is a former pro soccer player, told her that he noticed Blair filming when the pair left at the end. Holden's brother is a former pro soccer player, as well. He's currently a host for FOX Sports and the lead analyst for the 2018 FIFA World Cup on FOX in Russia. BuzzFeed News has reached out to Holden for comment. He was SO nice! Gave us permish for y’all to go give him some love. Blair said he was "a good sport about it and let us reveal his name." The story is blowing up. Celebrities got involved. People seriously lost whatever counts for chill nowadays. Hashtags like #PlaneBae and #CatchingFlightsANDFeelings were created. There were a lot of questions about the bathroom. Blair said they were "really sweet" people. And she said THEY LEFT TOGETHER. The stunt looks a little too perfect to some people, who have, of course, accused Blair of making the whole thing up, which she denies. @JoshCohenRadio @JohnLegere @TMobile Hey! I wish this was a stunt! I’m an actor and I would love the paycheck. 🤪🤪🤪🤣😂 I’d screenshot my bank account but it would be too humiliating. The theory that it was a T-Mobile stunt arose because in the screenshots you can see that Blair was using T-Mobile Wi-Fi. Blair has agreed to send BuzzFeed News flight details and her seating information, however, as proof. @JoshCohenRadio @JohnLegere @TMobile Oh man I would say I can show you my ticket stubs and also the email confirmations of our seating arrangement my dude. Blair's story did catch the eye of T-Mobile CEO John Legere, who was psyched about it. BuzzFeed News reached out to T-Mobile for comment. Responding via email, a company spokesperson said: "It’s not a stunt! Totally real and authentic. Our CEO is just awesome like that. 😊"